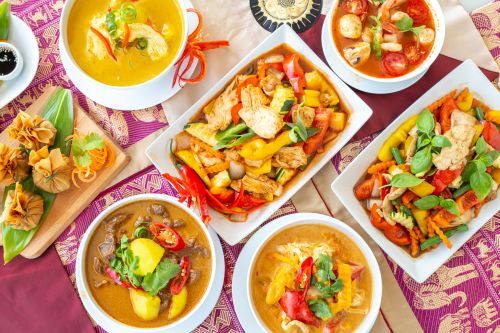 Menulog delivers for Thai Junction Kitchen so you'll be able to track your courier on a map. Deep fried tofu accompanied by our sweet chilli sauce with crushed peanuts. Golden fried pastry filled with vegetables and vermicelli noodle served with homemade sweet chilli sauce. King prawn marinated in garlic and herbs wrapped in spring roll pastry served with homemade sweet chilli sauce. Chicken minced, mushrooms, water chestnut, carrot and corn wrapped in pastry served with homemade sweet chilli sauce. Golden fried puff pastry filled with mild curry chicken minced, potato and onion served with homemade sweet chilli sauce. Minced fish with chilli paste, lime leaves served with sweet chilli, crushed peanut and cucumber sauce. 1 x Golden Bag, 1 x Curry Puff, 1 x Fish Cake and 1 x Spring Roll. Served with homemade sweet chilli sauce. Deep fried fish balls served with homemade sweet chilli sauce. Deep fried prawn balls served with homemade sweet chilli sauce. Steamed dumplings stuffed with chopped chicken, onion and shiitake mushroom served with sesame soy sauce. Chicken marinated with special Thai spices and grilled served with peanut sauce. Tempura battered chicken breast fillet glazed with honey and roasted sesame seed. Fillets of beef cooked in a blend of freshly crushed garlic, oyster sauce and pepper. Grilled Thai style marinated chicken served with homemade sweet chilli sauce. Deep fried king prawns and roasted cashew nuts topped with crispy basil leaves served with sweet chilli sauce. Assorted seafood stir fried in spicy chilli sauce, Thai herbs, vegetables and basil leaves. Fresh vegetables and tofu cooked with a red curry paste and coconut milk. Fresh vegetables and tofu cooked with a green curry paste and coconut milk. Mild vegetables and tofu curry with coconut milk and ground peanuts. A delightful, mild chicken curry cooked with onions and potatoes topped with fried shallots. The most popular medium hot Thai green curry with coconut milk and mixed vegetables. Spicy red curry paste in coconut milk base with mixed vegetables. Thai style pumpkin red curry with vegetables, basil leaves and your choice of meat. Tender pieces of beef cooked with tanggy curry with coconut milk, peanuts, onion and potatoes. A spicy sweet curry of tender lamb fillets, vegetables and coconut milk. Thai signature dish consists of roasted duck, pineapple, cherry tomatoes cooked in red curry paste and coconut milk topped with lychee. Stir fried tofu with onion, capsicum and vegetables topped with cashew nuts. Pan fried fresh vegetables and tofu in oyster sauce. Stir fry with fresh garlic, pepper, coriander and vegetables. Stir fry with fresh vegetables and oyster sauce. Stir fry with fresh ginger, mushrooms, vegetables and oyster sauce. Stir fry with fresh cucumbers, onions, tomatoes, capsicum, pineapple and carrots served in a sweet and sour sauce. Stir fry with fresh onions, vegetables, chillies and basil leaves. Stir fried vegetables, peanut sauce and your choice of meat. Stir fried chicken with onion, capsicum and vegetables topped with cashew nuts. Duck breast wok-tossed with fresh vegeatables, chillies and basil leaves. Stir fried rice noodle with bean sprout, peanut, egg and chive in tamarind sauce. Fried rice with pineapple, chicken, cashew nut and vegetables. Stir fried thick flat noodles with a classic sweet soy sauce, egg and vegetables. Stir fried rice noodles with chilli jam, fresh chilli, basil and vegetables. Grilled beef salad with mixed herbs, cucumber, tomato, lemon juice and chilli. Spicy and sour soup with lemongrass and mushrooms. Spicy coconut soup with galangal root, lemongrass and mushrooms. Marinated chicken and prawns minced wrapped in wonton pastry with vegetables.